Woodcut illustration published in Frank Leslie's Illustrated Newspaper, depicting guests in a dining car on a Hotel Express Train. 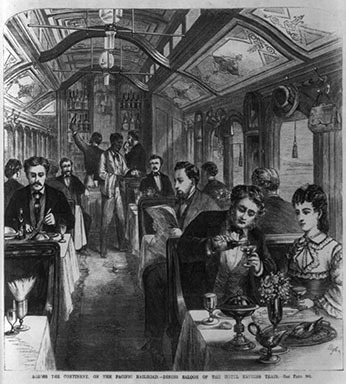 Caption: "ACROSS THE CONTINENT, ON THE PACIFIC RAILROAD - DINING SALOON OF THE HOTEL EXPRESS TRAIN." Frank Leslie's Illustrated Newspaper, “Dining car illustration from Leslie's Illustrated,” USU Digital Exhibits, accessed April 20, 2019, http://exhibits.lib.usu.edu/items/show/19286.